John Wagner talked to us, but we just sat there. He was the minister at my church when I was a teenager. He would preach; we Methodists would listen respectfully; but we wouldn't react. He wanted to involve us in a dialogue, but we weren't doing our part. If he made a joke we'd laugh, but most of the time we just stared blankly back at him. He must have felt like a professor whose students never asked any questions. Did we even understand what he was saying? One Sunday, he tried to make the sermon more interactive. He secretly gave lines to two or three members of the congregation, instructing each of them to startle the rest of us. At a certain point, each of these "plants" stood up and objected to what the preacher had just said. Unfortunately, this ploy failed. It did not change our attitude. Sunday services did not become wide-ranging discussions. We still listened passively, then shook Rev. Wagner's hand on our way out and told him we enjoyed his sermon. Ever since, however, I've been thinking of ways to add drama to traditional performances. For example, take Beethoven's Ninth Symphony. When it begins, there's an orchestra and a chorus on stage, but for nearly an hour the orchestra plays while the chorus does nothing. At the beginning of the fourth movement, four vocal soloists parade onto the stage, sit down, and also do nothing. Finally the baritone interrupts the orchestra with a recitative. Then the chorus and the other soloists join him for the last 18 minutes of the symphony. This vocal interruption is meticulously planned, of course. But the words imply that the singing is a spontaneous outpouring of emotion. I think that the staging should contribute to this effect. Any neophytes in the audience may expect a performance that's purely instrumental. Most symphonies are, and this one appears to be. They will be doubly dazzled when, without warning, the music blossoms into ecstatic song. First off, for American audiences let's sing in English. Also, let's translate "Freude" (Joy) by using the word that supposedly the poet secretly had in mind, "Freedom." The singers should not be seen until they're needed. Depending on the arrangement of the concert hall, the chorus could be behind a curtain, or maybe they could eschew robes and pretend to be ordinary audience members. Let's hide the baritone soloist within the orchestra itself, perhaps disguised as one of the violinists. Six minutes into the fourth movement, those who are familiar with the Ninth Symphony are puzzled. What happened to the singers? If I were producing a condensed form for television, I'd begin with only one cello and one double-bass on camera, playing in unison the melody that starts at measure 92 of the fourth movement. (I checked my Kalmus miniature orchestra score to confirm the details.) The viola, bassoon, and other instruments would gradually be revealed to add their harmonies. They build toward measure 216, when . . . . The instrumentalists play a dramatic cadence and stop. The baritone springs to his feet, spreading his arms, violin in one hand and bow in the other. "My brothers!" he cries to his fellow musicians. "Stop all this playing!" The strings uncertainly play a couple of measures, then hold a chord. "Rather, let us raise our voices up, in singing"  the orchestra exclaims with four chords  "our praise of freedom!" Another chord for emphasis. Freedom, to thy shrine we come! All whom custom's laws divide! The altos, tenors, and basses of the chorus, now revealed, repeat the second half of this verse. Then two more soloists walk on to join the baritone, followed by the soprano soloist entering from the opposite side. And so on to the glorious end. Handel's oratorio The Messiah is also presented in concert style, with an orchestra and chorus and soloists. It's in three parts, depicting Christ's birth, death/resurrection, and subsequent rule in heaven. There are a number of ways that this oratorio could be made more dramatic, short of turning it into a fully staged opera. I've been picturing these ideas in my mind ever since I first listened to The Messiah decades ago. For example, near the end of Part One is the aria in two verses, "He shall feed his flock like a shepherd." Often the two verses are performed by two different singers. Let's have the contralto sing from the stage as usual, but then, in a higher key, the soprano walks down the aisle into the audience as she gives the invitation, "Come unto him, all ye that labor; come unto him that are heavy laden, and he will give you rest." In Part Two, Jesus is "despised and rejected of men, a man of sorrows and aquainted with grief." The chorus riotously sings "All we, like sheep, have gone astray. We have turned every one to his own way." The music slows: "His. Own. Way." It comes to a stop. At that point, let's suddenly turn off all the lights except for one spotlight on a hitherto unnoticed object. 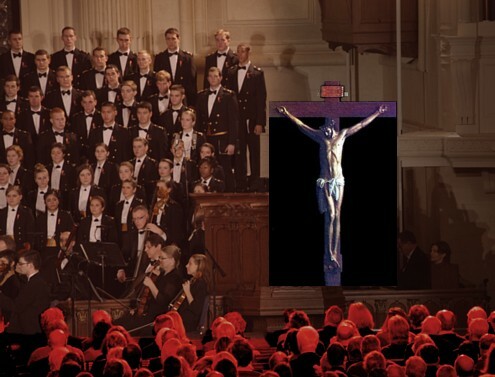 The chorus resumes very slowly and dramatically: "And the Lord hath laid on him"  the spotlighted object turns toward us and we see that it is a crucifix, as I've simulated below  "and the Lord hath laid on him, hath laid on him"  then red illumination washes over the audience  "the iniquity of us all." Perhaps mirrors have even descended from the ceiling, and we sinners are confronted by our own image. Elsewhere on this website, I describe a 1974 telecast in which I used slides of iconic buildings to illustrate a line from the Hallelujah Chorus: "The kingdom of this world is become the kingdom of our Lord and of his Christ." We could also use the iconography of the Agnus Dei, in a carved three-dimensional represenatation. At the very end of this concluding chorus, the music builds to an impressive cadence, a dramatic pause, and then the final emphatic "Amen, amen!" During those last ten seconds, I think the lamb should be transfigured. Turn every available spotlight on it, set off a magnesium flare, do everything possible to make it seem to glow briefly as bright as the sun in heaven. Then the light and the music end, and the oratorio is completed. Finally, I've imagined a motion picture, a sort of romantic tragedy. Melissa is a small-town beauty, a high school senior 18 years old who dreams of wealth and glamour. After a major argument with her parents, she cuts all her family ties and leaves home to seek her fortune in the big city. Melissa's looks enable her to become acquainted quickly with some wealthy, influential people. An older man befriends her. Richard is a fast-talking dealmaker who dresses elegantly and drives a shiny silver Rolls-Royce. He spends freely; even the food he buys for his pets is better than what most people can afford for dinner. And he spends freely on Melissa, including clothes and jewelry. They go to an elegant party in a penthouse. Melissa laughs at the performers' songs and jokes, but afterwards when she encounters them in the hallway, she snubs them and walks away. Nor does she have time for the homeless people on the street. If she can't avoid beggars, she grudgingly gives them a coin or two. She keeps encountering one street person in particular: a short, wild-eyed man in a long coat who hints about contraband for sale and speaks in elaborate metaphors. Richard pulls some strings to get her enrolled in an Ivy League university. However, she prefers partying to studying. Her friends warn her that she shouldn't take things for granted, but she doesn't listen. She soon drops out of college. Then she discovers that Richard has been taking advantage of her and isn't nearly as wealthy as he pretended. Her life begins crashing around her in other ways as well. Once upon a time, you dressed so fine. People'd call, say, "Beware, doll! You're bound to fall." You thought they were all kiddin' you. And now you find out you're gonna have to get used to it. And ask him, "Do you want to make a deal?" When they all come down and did tricks for you. You never understood that it ain't no good. Exchanging all kinds of precious gifts and things. But you'd better lift your diamond ring. You'd better pawn it, babe. Go to him now. He calls you. You can't refuse. You're invisible now; you got no secrets to conceal.